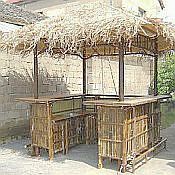 If you are looking to add some true island flair to your back yard then look no further than this 8ft x 8ft Tahiti Natural Bamboo Tiki Style Bar Hut. This Tiki Style Bar Hut is perfect for entertaining your friends and guests. This hand crafted bar is made with processed Muso bamboo for strength and longevity. This tiki bar hut can become the center of your entertainment events and a perfect complement to your patio, outdoor kitchen, backyard or indoor / outdoor pool! The are also ideal for businesses who need to create a tropical theme setting. Our Tahiti bamboo Tiki Style Bar Hut is designed with a lower recessed mixing counter and comes with classic professional bar counter design and a dry built-in stainless steel sink. This design means all drink making can be relegated to the counters below. As a result, drink making spills will not occur and space will not be taken up on the bar counter space where friends and family will be relaxing enjoying your Tiki Bar! The Tiki Style Hut Bar provides generous shelf space underneath the counter and built in doors protect from dirt and insects. The counter top extends 8" over the cabinet wall to provide ample leg room and the leg rest rack is strategically located just above the footings. Glasses can be hung on the racks just above the counter top. The roofs panels extend 8" over the edge of the counter. The counter is 30" wide and 44" high. The roof is built with tropical elephant grass thatching on 1/4" bamboo plywood. 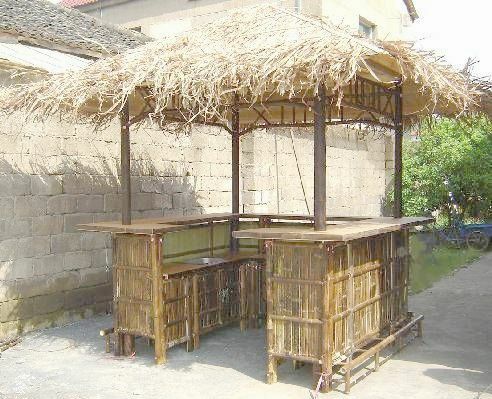 We also offer optional bamboo bar stools and chairs to match your bamboo Tiki Bar Hut selection. Assembly with at least three persons is required to put the big panels together, packages will be shipped via commercial trucking for curbside delivery only.